Angie's Guest Cottage is located on the East Coast of the United States in beautiful Virginia Beach, Virginia, 200 miles southeast of Washington, D.C. and 15 miles east of Norfolk, VA. Angie's Guest Cottage offers lodging one block from the beach and one block from the 24th Street boardwalk stage offering free entertainment in the summer. Ideally situated in the heart of the resort area, Angie's is within walking distance to "Beach Street" entertainment, shops, museums, restaurants, nightclubs and boardwalk events. 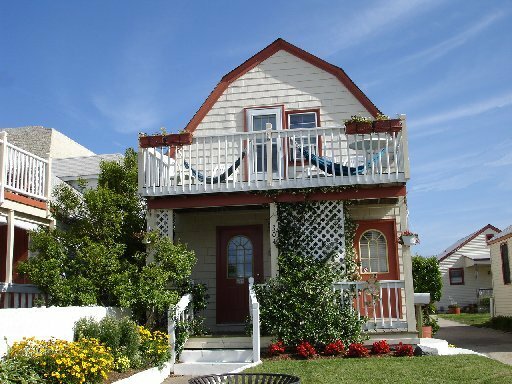 The original house had a colorful role in the life of Virginia beach when it was built in the earky 1900's. Local historians have discovered that the cottage was host to families of "Coasties" enjoying summer vacations while their "surf men"were stationed at the U.S. Coast Guard Station (now a Museum located on the boardwalk at 24th Street). After the cottage became a private home, the real "Angie" bought it and began welcoming overnight guests. In 1978 the Yates family acquired the interesting home and created quant lodging in the main house. "Cottage Row" rooms are next door to Angie's main house. 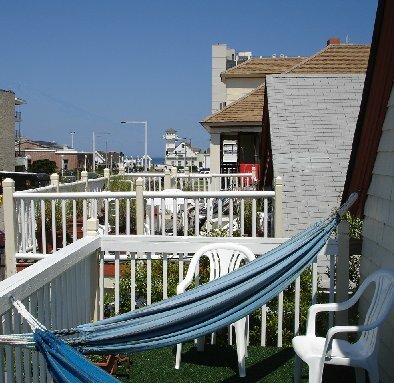 Ocean view from Angie's one bedroom private sun decks. Angie's invites you to a delightful experience--traditional Virginia hospitality with a unique beach twist, at her Guest Cottage. Angie's Guest Cottage is comprised of individual lodging units, efficiencies, one bedroom apartments with private decks. Angie's seven guest units are charmingly decorated with comfort a must. One bedroom units have a full kitchen & private sundeck. All other lodginging units have mini-kitchen, private bath, private entrance, and individually controlled heat and air. All guests are invited to take time to relax on our lounge chairs or just have a snack on the picnic tables located in the shaded back yard, where a barbecue, picnic tables and ping pong are available. Angie's main building is open from April 1st to October 1st. Cottage Row is open all year round . Lodging Reception Hours: 9:00 a.m. to 9:00 p.m., in-season. Irregular hours in off-season. Check-in: 3:00 p.m. If you need to arrive later than 6:00 p.m. please let us know at the time you make your reservation. Check-out:Between 9:00 a.m. and 11:00 a.m. for Main House units and Cottage Row. Unregistered guests are not permitted on the property. We have an iron and ironing board available for your convenience. Information Board under picnic shelter for suggestions on activities and directions. On site coin operated laundry. 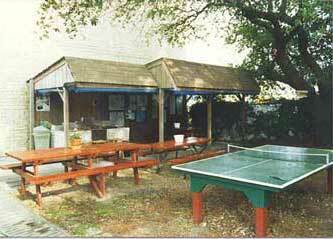 Parking available, one vehicle per unit, for Angies Guest lodging and Ocean Cove Cottages only.